We’d like to thank all of our members who entered their photos in our 2013 Calendar Photo Contest. The range of talent and photographic skills were amazing and our judges had a difficult time narrowing down our winners. Out of almost 400 eligible entries, we’ve selected one cover photo winner and 12 photos to represent each month. Congratulations to the following members whose photos have been selected as our winners: Heather Quick, cover winner ($100 VISA Gift Card). The following winners each will receive a $25 VISA Gift Card: Susan Weigel (January); David Hawkins (February); Brenna Johnson (March); Patricia Cook (April); Daniel Black (May); Steven Shaffer (June); Janis Brode (July); Christopher Young (August); Amanda Kirkhoff (September); William Martin (October); Amanda Souders (November); and Sue Hallett (December). 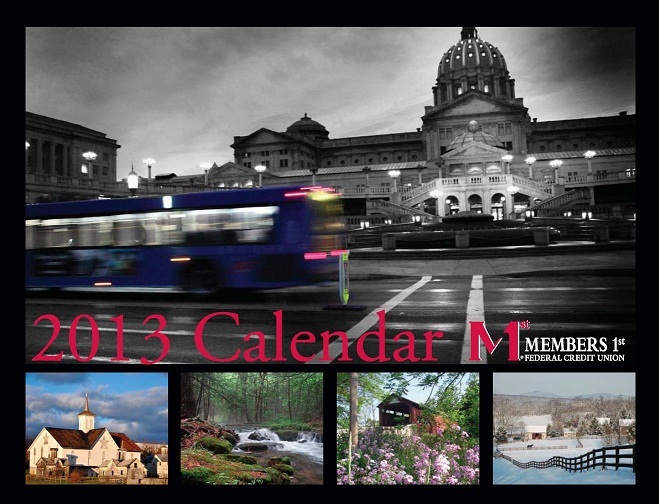 Copies of the 2013 Calendar will be available on Credit Union Day, Thursday, October 18 at all Members 1st branches. We are planning a photography contest next summer for our 2014 Calendar. Please watch for contest rules and details. We look forward to seeing our members’ photo entries next year.